A lot of our clients—both for Design in a Day™ and our custom, strategic process—are shocked that we typically start by recommending a small-scale website. Design in a Day™, in fact, is usually only a five page website, and we encourage our custom clients to think about keeping their page count low, usually at 10 pages and under. Why is this? Because in most cases, we find that websites can indeed be small and mighty. So, how big of website do you really need? As I mentioned, for Design in a Day™ (which is a Squarespace-only, efficient process), the sites are usually limited to five pages. Why? Because that solution is geared toward new businesses and entrepreneurs who are just starting to pull together a cohesive marketing plan. Keeping a site at five pages or fewer equals a streamlined enough website that as you get a feel for your clients and customers, you can adapt and adjust. If you launch a new brand, organization or an overhauled message with 10, 15, 20 or more pages, retooling and adjusting in response to your still unknown market (no matter how well you research, you just don’t know how people will respond until you know), becomes exponentially more challenging. Do you really want to find yourself six months into a new business and realize that your services referenced on every single page of a 20 page website need a massive overhaul? Sutro Li, a custom, strategic website that’s just five impactful pages. Learn more here. That takes you into serious redesign territory and risks that you may have disconnected, inconsistent messages if that redesign is approached haphazardly. And, frankly, evaluating, retooling and tweaking is a reality of launching a new business so it’s wise to plan to have to modify your website sooner rather than later. Even established organizations can find that their website has taken on a life of its own, with random pages popping up that may have outdated information on them or pointing to services you no longer offer. Additionally, another common situation I see is website page content that would better function as a blog post. This is where things get a little blurry, but I encourage website owners to think of their website pages as key, top-level information. You want to give visitors enough information so that they can make a decision if you’re the right business or organization for them. You want them to take the next step. What a lot of people who are working in their business all day, every day do, however, is want to give all the details to the prospective visitor. Unfortunately, research tells us over and over again that this is simply too much for people to process and they become paralyze with indecision. If you organize your site into logical “buckets” of information, it becomes easier to see that the cornerstones of your site are relatively lean. Then you can take the unneeded page level information and rework that into blog posts. What kind of content works better as blog posts versus page content? Like I said, your streamlined site should only content top-level information. The blog is where details and nuance can really shine. So, for example, if you’re a law firm specializing in wills and trusts, you main website practice area pages can discuss at a high level the types of wills and trusts your firm can handle and your general approach to that work with clients. 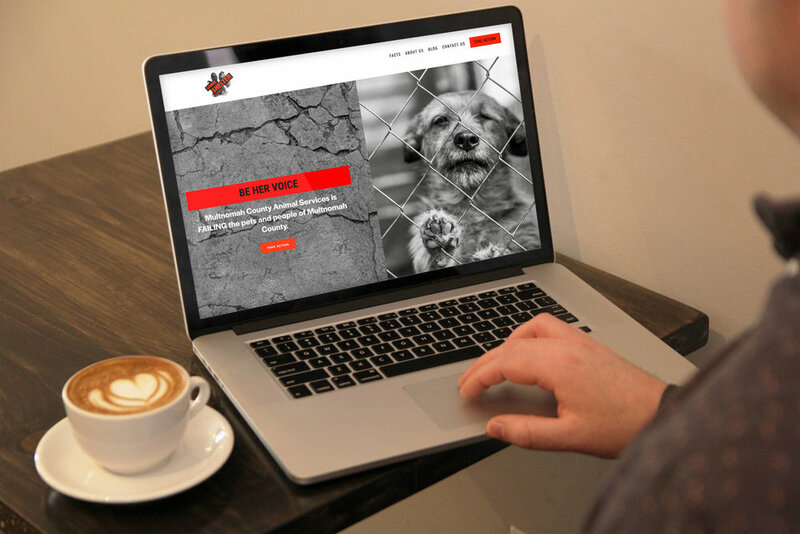 Gimme Shelter - This Design in a Day™ project is a nimble website for a campaign to improve conditions for shelter animals. The homepage tells the story, while the other pages funnel visits to take action. The blog is an ongoing educational and resource project ensuring the site is a living entity. In your blog, you can get specific, revealing different considerations you encourage clients to make when evaluating a trust, for example, or revealing “hidden secrets” your clients may need to know. You can also use the blog to demystify the process of working with a wills and trusts attorney. Ideally, this blog content will build upon itself, and you can even pull posts from different categories onto your main services page, again, creating a vibrant web of content. Oftentimes when we evaluate websites for a redesign, we recommend huge chunks of existing content be “quarantined” and then repurposed into a series of blog posts. Not only can this be far more digestible to visitors who are clearly interested in what you have to offer (they’ve gotten far enough to read your blog), it can also help your search engine optimization strategy—who doesn’t love that? How do you know if a page should stay or go? The litmus test we apply is twofold. First, we look at the page in context of the overall journey through the site. Does it logically flow from page to page as you visitor (NOT YOU!) would move through the site? Are there calls to action that feel organic and not simply smashed into the page? If the information high level or nitty gritty? Secondly, we dig into the data. We look at how well trafficked a page is (it’s surprising how many pages on websites will have fewer than five visitors, or even zero in a single month), and if it’s getting really lonely, we analyze why. Sometimes those pages can be retired. We also look at the keyword rankings and see how that page is performing for your target keywords. Sometimes we’ll make the decision to leave a page in the site architecture even if it’s not quite flowing with the rest of the site because its performing will in search and serves as a “backdoor” into people finding your website. When it comes down to it, if in doubt, leave it out. This is particularly true for new website owners. You don’t need to tell your potential clients, customers or supporters all the things right now. You have many “touch point” opportunities to engage with clients, and that includes off-line locations as well. Perhaps that detailed process chart you’re dying to share on your website would actually be more effective to share when you have your first meeting with a new client? Or maybe its best in a digital tear sheet that your CRM (we use Dubsado for this) automatically shares with an inquiry? Want a bit of help planning your new website? We’re available for strategy calls and our Design in a Day™process includes our proven sitemaps as a jumping off point for your content.